When you think of hiking you might not immediately think of sandals as the ideal footwear – they naturally summon up images sun-scorched pavements and beaches rather than rocky trails and forest tracks. But what if I told you that many expert hikers actually prefer sandals to shoes especially during spring and summer? Here’s why: they’re lighter, more comfortable and airy during the hotter seasons, allowing the feet to breathe. If you’re not expecting your feet to take a particular pounding (or soaking), then switching your shoes for sandals could be a revelation. 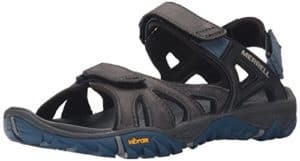 With that in mind, let’s take a look at what we consider the top hiking sandals for 2019 and beyond. These hiking sandals closely resemble heavily ventilated shoes. You get the same reliability as a quality hiking boot: namely, excellent grippy soles, and strong construction thoughout. The Arroyo II also comes with a patented rubber toe cap to prevent toe stubs which, as we’re all very aware, can be instantly fatal. 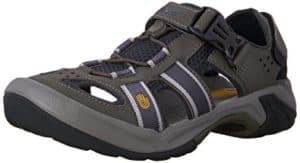 One of the best hiking sandals for men the Merrell Kahuna III is a great pick for your next adventure. Weighing only 340gms the sandal is extremely lightweight and comfortable but doesn’t take a heavy dive on stability and durability. The sole is very supportive and provides excellent grip on all types of terrain. The suede material upper is lined with anti-microbial protection to offer better hygiene. These hiking sandals for women have been designed keeping style and comfort in mind. They’re available in a wide variety of colours and have a unique design that was recognised as a better fit by some of our testers. These have speed laces, odor control and were extremely comfortable. An easy to maintain, lightweight, machine washable sandal that is perfect for all dry weather and every road. 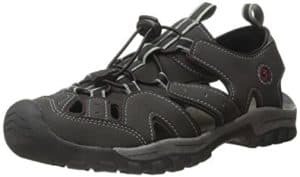 These closed toed sandals with a bungee closure are all-weather, all-activity footwear. The man-made soles ensure the perfect grip on most surfaces leaving you pretty confident during your hike. At only 245gms it is also one of the lightest hiking sandals available for women. It’s the perfect combination of comfort, style, and substance at an affordable rate. – Mostly closed design means they’re less breathable than some other options. 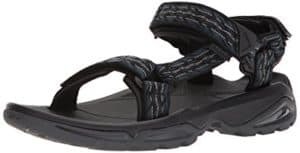 Teva is known for its quality products. The quality, however, comes at a price. These are probably the most expensive closed toe hiking sandals on this list. The price is reflected, however, in the top tier manufacturing and material quality. 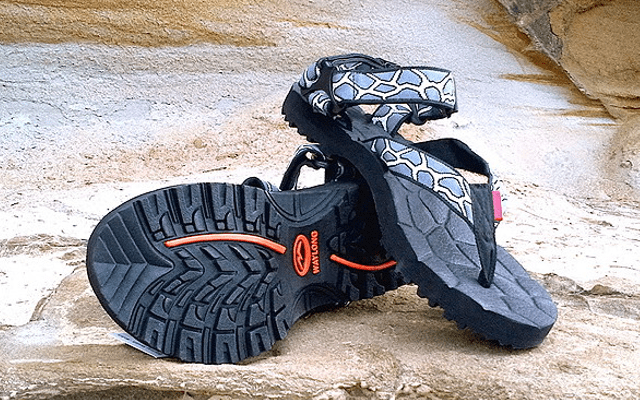 The Teva Omnium comes with a shock-absorbing heel which made for very natural walking even on rockier terrain. The quick release buckle makes them a doddle to slide off as and when required. A great product at a premium price if you’re looking for an upgrade to your existing shoe or sandal. If an open-toed sandal is at the top of your wish list then perhaps your best bet would be the Chaco Yampa Z2. Its gum rubber soles make for a perfect grip even on slippery surfaces such as mossy stones or boulders. 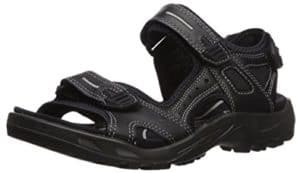 The sandal itself provides excellent comfort to your entire foot as well reasonable ankle support. 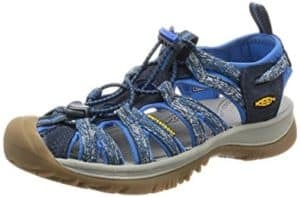 Durable, comfortable and easy cleaned, these hiking sandals for active women are perfect for hiking and outdoor activities in general. The hook and loop velcro straps on this shoes make for a great fit for every foot. They’ve provided for a soft inner lining to prevent blisters after long use. 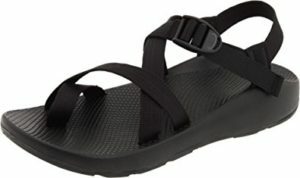 The open-toed hiking sandal is very comfortable at all times and supports your weight thoroughly on long walks/hikes. Flat or arched feet shouldn’t be a problem for this sandal, our testers thought it provided equal comfort to both. The ‘Sport’ in the name of this hiking sandal should give you an idea that it was built for rough use. The Anhu women’s hiking shoe is very attractive to look at, and just as comfortable as well. It’s lightweight, durable, waterproof and the perfect all weather, all terrain hiking sandal. Adjustable straps increase the chance of getting that ever-important perfect fit. It also has an anti-microbial footbed to reduce odor. 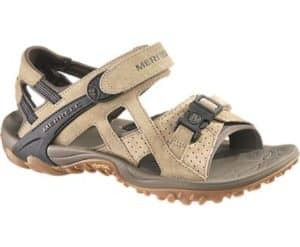 With three adjustable straps, the Merell Hiking sandal provides the optimal fit for all foot sizes. The Vibram sole provides great traction to the feet on all surfaces. The material is mainly waterproof leather which is also quick drying. Wading through the streams shouldn’t be a problem at all as long as you don’t mind wet toes. Available in a variety of colours, which is always nice! 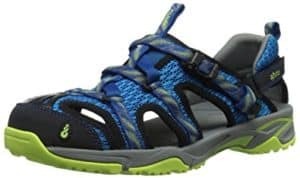 If you are looking for a hiking sandal that could almost be mistaken for flip-flops then look no further than a pair of the Teva Terra Fi 4. Completely open, the Terra Fi 4 provides great breathability to your foot. 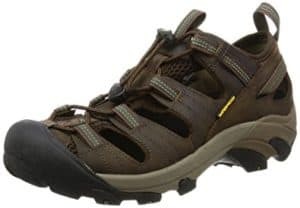 This men’s hiking sandal with its rubber soles is equally at home on the track or in wet conditions. What did you think about our list of the Top 10 Hiking Sandals for 2018? Do you agree with our list? Let us know in the comments below which sandal you would include and why, or pitch on that age-old question: socks with sandals? If you have any further questions about the best footwear for hiking in any weather and on any terrain, let us know, we’d be glad to assist you.